A tiny imaginary blue winged horse named Happy! 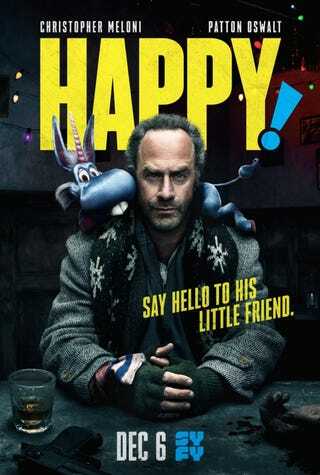 The relentlessly positive Happy (voiced by Patton Oswalt) is the imaginary friend of a little girl named Hailey, who was recently kidnapped by a deranged man in a Santa suit. He needs Nick’s help to rescue her. It won’t be easy. Nick has a laundry list of enemies (angry mobsters, ex-mistresses, ex-wives, and the police) that they’ll have to contend with, on their quest to save Hailey from a very bad Santa. Happy! premieres this Wednesday on Syfy at 10 pm. I will be posting a reaction thread for the show on Wednesday, but wanted to post this today, for anyone unaware of the premier or of the graphic novel it is based on. Though, I haven’t read Grant Morrison and Darick Robertson’s graphic novel, I am very interest in the series. Christopher Meloni is an inspired choice given his previous turn as the ironically named Det. Elliot Stabler on Law & Order: SVU. Nick might be a dark reflection of Elliot at his “Unstablerest.” It should be quite a sight to see, if the trailers are anything to go by. Again perfect casting. I can’t help smiling when I hear his voice. He was great as Todd from eHarmony in The Secret Life of Walter Mitty (actually better when just a voice than in person). And though I’d love to to see the Koenigs make a triumphant return to Agents of SHIELD, hearing him voice a tiny animated flying horse is still enough to make me happy. Join me in my happy place (the comments section) and share you thoughts on the show, the graphic novel or whatever else takes your fancy.